We are a leading Manufacturer of glass laboratory ware for scientific industry from Mumbai, India. 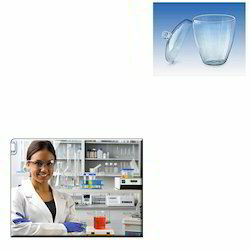 With sincerity and hard work of our professionals, we have carved a niche for ourselves in this domain by offering Glass Laboratory Ware for Scientific Industry. The offered product is manufactured using basic material and modular machines in compliance with set industry standards. Looking for Glass Laboratory Ware for Scientific Industry ?